Who doesn’t love to eat a crispy mozzarella stick out of the top of a mummy head? Mozzarella sticks have got to be one of the best, quick, crowd-pleasing snacks around. (Seriously, I made some for my friends on a beach trip this summer and I almost didn’t even get one, they were gone in two seconds!) 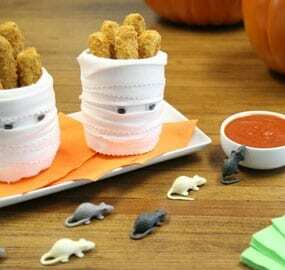 Also, how perfect are they for a pre trick-or-treating snack? Very perfect. Kids are typically too excited to eat dinner on Halloween night. Thoughts of a sugar rush just around the corner. Any kid (or adult food blogger like me) would get a kick out of snacking on a toasty cheese stick with “bloody” marinara sauce. 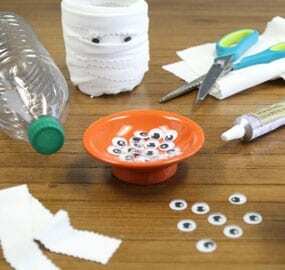 They can even help make the googly-eyed mummy bowls! For instructions click to the Farm Rich site!